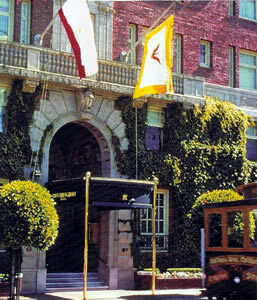 The Huntington is, without doubt, the finest traditional hotel in San Francisco. Here you might bump into your Savile Row tailor or your bespoke shoemaker from Bond Street, for this is the hotel to which these admirable gentlemen come to see their Californian clients. And the reason they come here is simple: The Huntington is a place in which those of taste and refinement (and, of course, wealth) feel at home. Here people observe the decencies, in both their manners and their dress. Effortless dignity, quiet good taste, considerate courtesy, sober comfort and sartorial propriety – these are what come to my mind when I think of The Huntington. It is true that not everyone cares for such things nowadays. (Indeed, my spirits sink when I see the number of folk who are happy to rush noisily about their chosen hotels, dressed as if they were about to clear out the cellars.) But there are – thank goodness – enough of us who do care for the maintenance of standards to ensure that certain bastions of tradition continue to prosper. And The Huntington is one of them. Perched on top of Nob Hill, this red brick tower exudes that feeling of discreet luxury which Americans are kind enough to call ‘European’. The Huntington is proudly, unashamedly, defiantly traditional. As soon as I walked into the lobby, my eye fell upon the oil painting behind the Reception desk. It was of King Charles II. The Merry Monarch looked pleased to be there. And well he might be pleased, for he liked good manners and comfort, and there are plenty of both in this establishment. 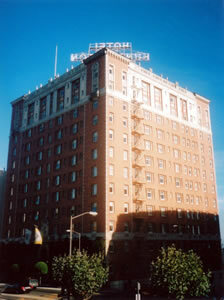 It was built in 1924 as an apartment building and was turned into an hotel in 1947. 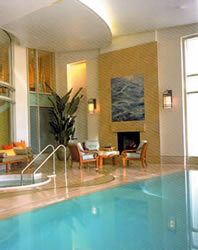 Its original purpose explains why its 136 rooms are known as some of the most spacious hotel rooms in the city. My own room, number 1010 on the 10th floor, lived up to the reputation. This was a Junior Suite. 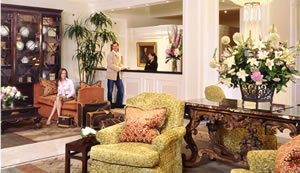 (As the rates change so much from day to day, you should check the prices for specific dates on the hotel website.) It was what I regard as the ideal size for an hotel room – 18 feet square. Its recent redecoration had been done very well indeed, with pretty references to Art Déco in the glass-stemmed standard lamps, the elegant lines of the sofa and the faux cheetah skin upholstery of the easy chairs. The walls were pale blue and the carpet was brown and striped. Even for your correspondent (who does not ‘travel light’), there was plenty of hanging space in the two fitted wardrobes. As always is in good American hotels, an ironing board and an iron were provided, so that I could ensure that my shirts were always pristine. 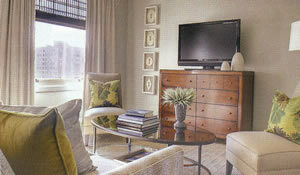 Three table lamps supplemented the standard lamps to ensure good lighting. The air conditioning was simple to use and effective. From the wall of windows was a lovely view of the city (pictured). One detail of my accommodation particularly pleased me. The wireless had been tuned to the local Classical music station (104∙9). Thus I could dress for dinner to the sounds of Bach and Mozart. The bathroom was bright and oblong. Its first section contained the two wash basins, and the tub and the loo were in the second section. Had I wished to indulge myself in a bit of ablutionary pampering in more expansive surroundings, I could have paid a visit to the hotel’s highly regarded Nob Hill Spa (pictured), which covers 11,000 square feet – but, to be honest, I am not really a spa person. The wine list has nearly 400 offerings, ranging in price from $40 for a Sonoma sauvignon blanc (Fritz, Russian River Valley, 2010) to $415 for the 2006 Chateau Angelus. 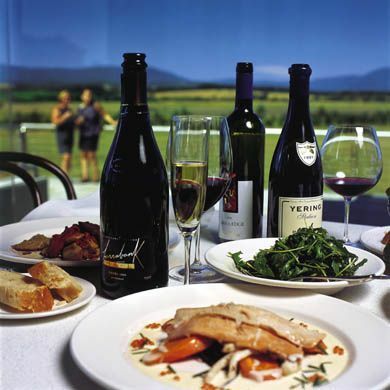 14 wines are offered by the glass, including a 2010 Italian pinot grigio (Bollini) for $10. Other bottles to catch my eye were: 2002 Cristal champagne ($410), 2002 Penfolds Grange ($380), 2005 Sassicaia ($280) and 2004 Opus One ($255). I returned to Big 4 the next morning. 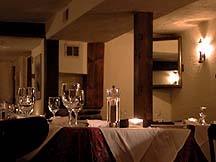 It struck me that it would certainly be the place for a ‘power breakfast’, for it has that dark, mahogany-laden atmosphere which is required for the completion of a big deal. There were numerous temptations on the carte, but, unusually abstemious, I confined myself to a Continental breakfast of coffee, orange juice, toast and very good croissants. From 8.00 in the morning until 4.00 in the afternoon the hotel offers a complimentary car to Union Square or to the Financial District. 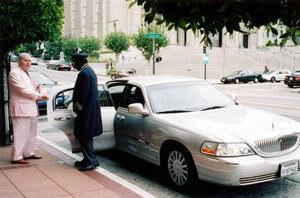 After my post-breakfast rest, I took advantage of this facility and had the Lincoln Town Car – driven by a careful chauffeuse – take me to the Marcus Neiman department store on Union Square. I recommend that you do the same. I like to go to the Belle Époque splendours of its 4th floor restaurant for a pot of tea and a cake. I present to you a photograph of the said motor car, as I was about to clamber on board near the hotel entrance. 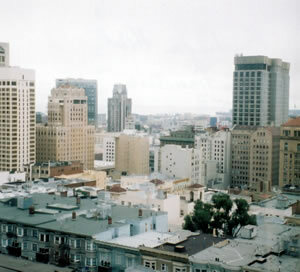 In the background you can see the steps of Grace Cathedral. It seems right that The Huntington should be so close to the house of God. Both, in their different ways, embody Tradition. On Thursday afternoons there is Choral Evensong – with a choir of men and boys – at the Cathedral. I went to it, and offered a little prayer of thanksgiving for The Huntington – the finest traditional hotel in San Francisco. 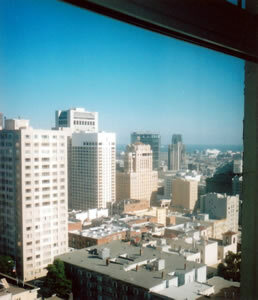 1075 California Street (at Taylor), Nob Hill, San Francisco, California 94108, U.S.A.
See the hotel website for the room rates for specific dates.